Last weekend, after gorging myself on ravioli from Vanelli’s Deli, I drove past a Germantown storefront labeled “Pie Folks”. I was excited – thrilled, even – at the prospect of a restaurant that only sold pie. Meaning he knew about it. He knew about the all-pie restaurant, and didn’t tell me about it because he “thought I already knew”. Apparently, all of Twitter knew about it, too. You’ve got to tell me about these things, people. I’m not a mind reader. I stopped by Pie Folks yesterday afternoon, in need of a treat after a long day of meetings. There’s space to sit in the small storefront, but I got three slices to go: apple, key lime and the appropriately named “Slap Yo Mama Chocolate”. It was seriously the best chocolate pie I’ve ever had. Mom, if you’re reading, you know I loved your Dream Whip chocolate pie, but I’m sorry, this is better. Way better. The key lime was nearly perfect, even though I didn’t eat it super cold. The merengue wasn’t stiff – it a little closer to the texture of whipped cream. The filling on the apple pie was pretty tasty, but I want their crust recipe. It was perfect – flaky without falling apart and thick enough to stand up to the filling. I want to eat it like cookies. Pie Folks has about 20 varieties of pie, a few of which are sugar-free. All of them are available as whole pies, half pies and by the slice ($3.99 per slice). If pie isn’t your thing, they’ve got cupcakes and some small lunch items (think sandwiches and soup). Pie Folks used to be in Olive Branch where I would eat their pies all the time. I can vouch for them having the best pies I have ever eaten! The crazy thing is, ALL their flavors are awesome. My favorite was their Chocolate. Awesome. Important question: is the keylime pie the kind with a puddinglike filling similar to lemon meringue pie, or the kind with a thicker consistency closer to cheesecake? I prefer the latter but the picture makes it look like the former. Sounds worth a try either way though, and maybe it can make me rethink my preference. Or I could just try the best chocolate pie you’ve ever had. I’m not offended but I will be offended it you “slap yo momma”! I will definitely check this out. You missed out not getting the dirt road pie. 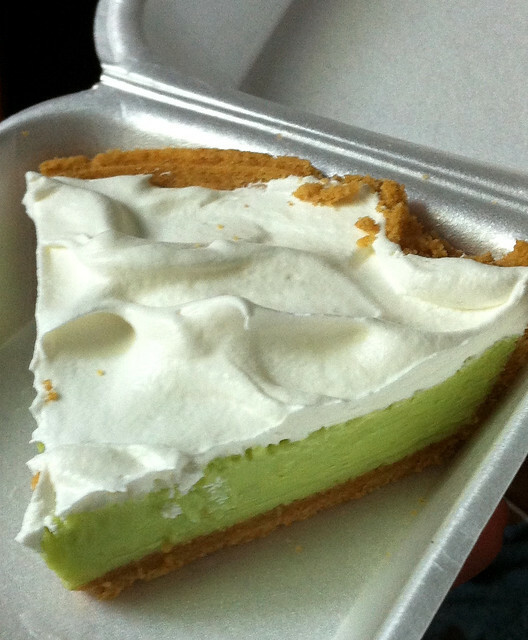 While good, the key lime pie wasn’t nearly tart enough for my tastes. Hey I just bought a GROUPON for this place!!! I am so excited to check it out!!!!! You must try their “Ape Wild” banana cream pie. I have never tasted a banana cream pie this awesome. You must check it out. I promise, you will be hooked for life! This is Audrey, “The Pie Gal”. Thanks for all the wonderful comments. I am humbled by your comments. We would love you to come in an try a free sample of the “Slap Yo Mama” Chocolate pie. Ron and Audrey Anderson, owners of The Pie Folk, in Germantown, TN. has the best pies in the world. If you love pumpkin pie then, you will go nutts over theirs. Go there, NOW! Free pie slice at Perkins! BOGO pizza pie at Cici’s, Whole Foods: fruit pies 3.14.